s an UNPer born and bred I’m as proud to be an UNPer now as I was way back when in my youth. One might ask why? It is because the party has always been for every citizen in this country, irrespective of race or creed. It has never been a racist party. It has always unwaveringly stood for democracy, freedom, justice and the rule of law. The UNP in the Senanayake era always had someone from a minority community as Chairman. At that stage, it was the late DR M.C.M. Khaleel. 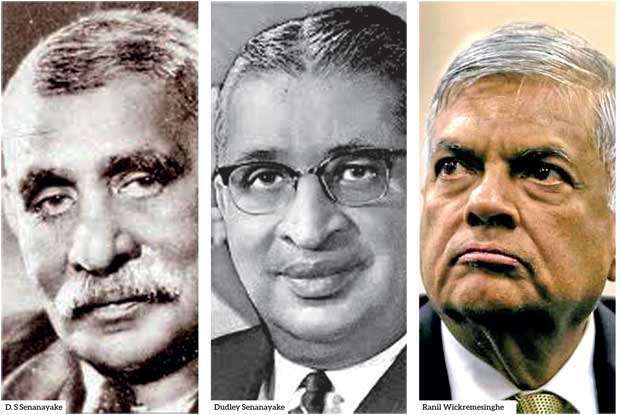 Although this was changed later, Ranil Wickremesinghe has later appointed Kabir Hashim as Chairman of the UNP. The late D. S. Senanayake, was before my time, but in reading about him, and also about my great-grandfather, the late Charles Henry de Soysa, who was one of the first members of the Ceylon National Congress, from which stemmed the UNP, I have gained immeasurable knowledge about the Father of the Nation and what he stood for. Presentations on screen are always shown at UNP events at Sirikotha at which all past leaders of the party are honoured, by displaying their words and deeds for the present generation to learn about them and their vast contributions to the country. I am also aware that two of the late DS’s closest advisors were the late D.R. Wijewardene and the late C.L Wickremesinghe, both grandfathers of Prime Minister Ranil Wickremesinghe, the present leader of the UNP. I knew the late Dudley Senanayake well, worked under his leadership before my marriage and later with my late husband, Chandra Karunaratne, to whom he was a mentor and who was one of his closest supporters. We stood by the late Dudley through the crises he faced from both within the party and outside it. He will always be my favourite politician, who made me become a Director of the Board of the Dudley Senanayake Foundation. We have a memorial oration for him annually, with the partnership of the Friedrich Naumann Stiftung. Last year the distinguished orator was Prime Minister Ranil Wickremesinghe who kindly gave us the use of the Banquet Hall at Temple Trees for the event. He stressed on the incomparable contribution to the development and progress of the country by Dudley Senanayake and his father before him. As one who knew the late Dudley’s thoughts on politics, I know that he too would have been proud of the party and the present path it treads through both stormy and calm waters. There were indeed charges of corruption at that time too, against Ministers. Like the Senanayakes, DS and Dudley, the UNP today headed by Ranil Wickremesinghe, also steadfastly believes that each one should be honoured according to his/her own worth, not categorized, penalized or suspected because of race or creed. Our Leaders both then and now, have always spoken the truth, never made false promises, walked the straight path. Both the late Dudley then and Ranil now were and are used to winning and losing and treating ‘those two imposters just the same’. The UNP headed by the Senanayake’s and at the present moment, have ensured that the country was ruled democratically and according to the rule of law, whenever in power. This has been always been a characteristic of the UNP and it has not veered away from this course, whatever the circumstances may have been. The party has never failed in respecting the right of every individual to fair and just treatment. The UNP today, believes as it did then, that the greatest feats of man have been the achievements of a free and unfettered mind. The UNP has always believed that economic freedom can only be built on the foundation of political freedom which we have now achieved to a certain extent. As well as being a UNP supporter all my life, I have been closely associated with the party as my late husband was an MP, a Deputy Minister, and a member of the working committee from the time of the late Dudley till he died in 1997. "Blunt misrepresentation of facts and abuse of truth used time and again will not deter the UNP in its journey forward under the present Leader who has groomed an excellent second string which no other party possesses. Something the late Dudley said remains forever in the recesses of my mind." I was also a member of the working committee for a few years till 2016. The party I have always supported through thick and thin, through defeat and victory has never changed from the ideals, values and principles of its founders. Times have changed but not the party. It is wrong to compare cabinets now with those of the late DS and the late JR. These were solely UNP governments which were won with vast majorities. The many problems existing today were nonexistent then. We did not have a long drawn out war. The county was not plunged into debt by the extravagances of a former dictatorial regime and nor had it made enemies of countries in the democratic world in those days. I’m sure former President Chandrika Kumaratunga would say that the SLFP isn’t the same party as that begun by her late father. We did not have a situation when power was misused to the extent it was during the last regime with state power being used to abduct, to kill, to intimidate. There are ways of tackling problems that have to change with the evolving of different situations through the passage of time, but the values and ideals remain the same. Blunt misrepresentation of facts and abuse of truth used time and again will not deter the UNP in its journey forward under the present Leader who has groomed an excellent second string which no other party possesses. Something the late Dudley said remains forever in the recesses of my mind. That he prays and hopes for the day when every citizen of this country can state with pride; “This is my own, my native land’. I know that the present leader of the UNP feels the same way too. I have always been and will remain an UNPer till I die, because it is the only party that I believe can take this country forward with pride to new beginnings, sticking to the ideals that the founders instilled, stood for and believed in.